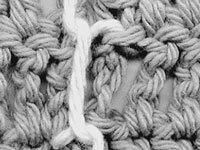 The blanket stitch is great for joining crocheted pieces that have longer stitches, such as triple crochet and taller. Joining seams with blanket stitch adds some stability to the backside of the seam and reduces the seam’s tendency to gap. 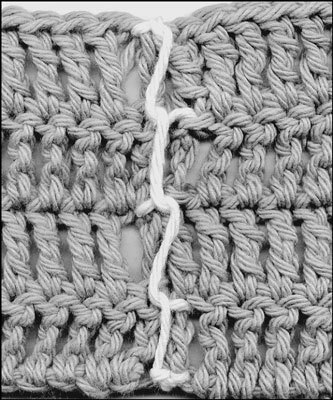 Remember to always join the taller stitches at the top and at the base, which is how the stitches are joined to each other within the fabric. 1With the correct sides facing each other, lay the pieces of fabric on a flat, smooth surface and align the edges and stitches. You may have to lay the fabric on the right side or wrong side, depending on the pattern. 2Using a yarn needle and matching yarn, thread the yarn through the base of the first few corresponding stitches. 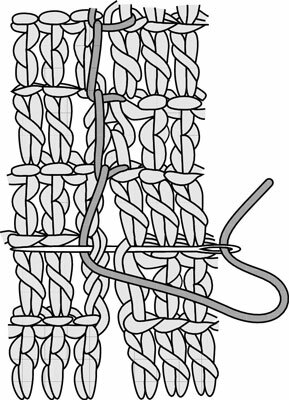 Leave a yarn length to weave in later to secure the seam. 3Lay the working end of the yarn against the fabric. Position the yarn in the direction of the stitches. 4Thread your yarn through the base of the next 2 corresponding stitches. Make sure that the working end of the yarn is underneath the needle. 5Repeat the two preceding steps across the edges to be joined. Continue until you reach the edge of the join. 6At the end of the seam, weave the yarn back through several stitches to secure. 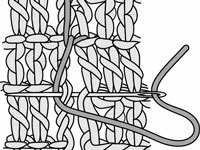 This procedure completes a blanket stitch seam.